1 For the muffins: heat the oven to 180°C (160° fan) 350°F gas 4. Grease an 8 hole muffin tin. 2 Beat the butter butter and sugar together in a mixing bowl until light, then add the eggs one at a time, beating well until incorporated. 3 Add the flour, baking powder and ground almonds to the cake mixture and fold in until smooth. 4 Spoon the mixture into the tins to cover the base. Stand 4 pear quarters in each tin and carefully spoon the mixture over and around the pears. 5 Bake for 20 minutes, until the cakes are the pears are soft and the muffins are cooked through. Cool in the tins for 5 minutes, then place on a wire rack to cool completely. 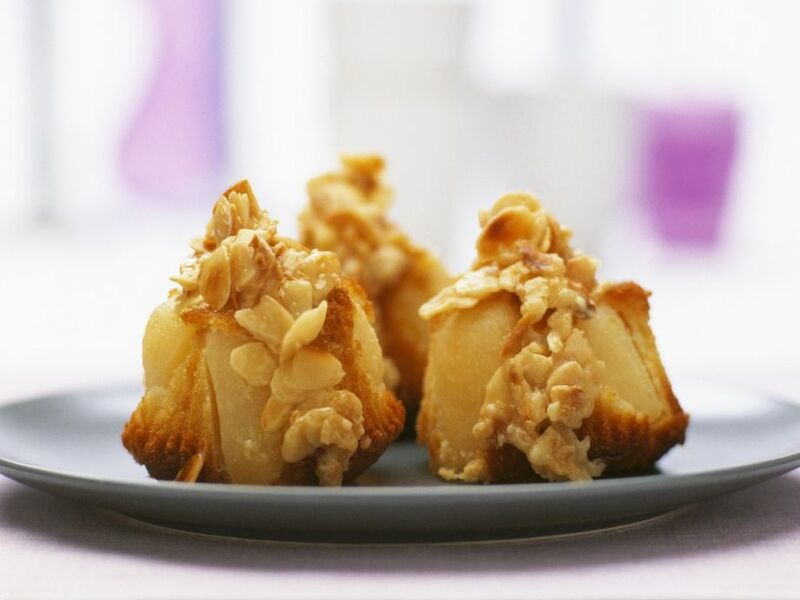 6 For the crispy almond topping: lightly oil a baking tray. Heat the sugar and water in a pan over a medium heat, swirling the pan from time to time until the sugar dissolves, but don’t stir, as this can cause it to crystallise. 7 Reduce the heat to very low and simmer gently until the liquid forms a pale golden caramel. Tip in the toasted almonds and cook gently for 2-3 minutes until the caramel is a light golden colour, then immediately pour onto the oiled tray and set aside to cool and set. 8 When the caramel has set, break into pieces and place on the muffins.